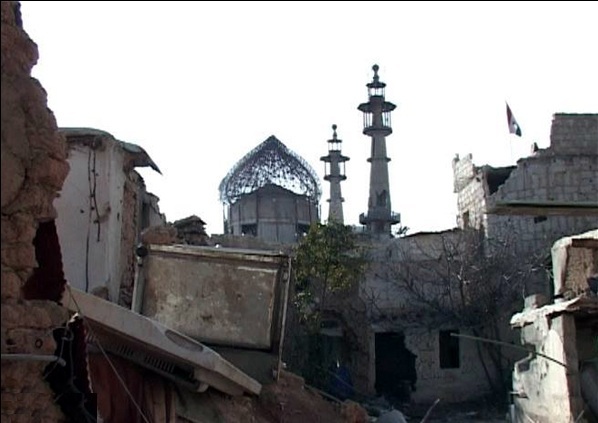 JNN 07 Feb 2014 Damascus : Wahabi / Takfiri terrorists in Syria Once again targeted the shrine of Bibi Sakinah Bintul Hussain a.s , the daughter of the third Shi’a Imam, Hussain ibn-Ali (P), in Daraa – Syria on Wednesday. According to the Lebanese news website Al-Ahd, affiliated to Hezbollah Islamic resistance movement, The missile attack which was launched from a remote area, the holy shrine’s dome was partly damaged. The News Agency added that the Syrian Army which had liberated the Same Holy Shrine of Lady Sakina Binte Hussain a.s , from the occupation of the Wahabi / Takfiri Foreign Terrorist almost a month ago , and now after the recent attack the Government forces have started a search Operation and are carrying out an Operation for the cleansing of the Takfiri Terrorist from the area in the vicinity of the Shrine , so they can clearly Clean off the area from the Presence of the Takfiri Terrorist . The Wednesday attack from far Off distance is believed to have been conducted using a locally manufactured missile. Sayeda Sakinah was born on 20th of the lunar month of Rajab, 56 AH. Her early years were said to have been spent in Medina. Her brothers included Ali ibn Hussain, Ali al-Akbar ibn Hussain, and Ali Asghar ibn Hussain. Her sisters included Fatimah as-Sughra’a and Fatimah al-Kubra’a. According to History, she accompanied her father, Imam Hussain (P) when he traveled from Mecca to Kufa. Imam Hussain decided to travel to far Off Land , as he was aware of the Yazeed’s Plan of Blood Shed in the Holy Land of Mecca and Medina , But finally He was forced to counter the war Which was enforced by the Army of Yazeed on Him . He was not in the favor of War , As he was traveling with his family and friends , and with his Own & Friends Families , and which also includes Women and Children , as some of them were , as Young as 6 months old , And Lady Sakina , her beloved daughter was even 4 years old at the time of the event of Battle of Karbala , as the Yazeed’s Army Declared War on Imam Hussain a.s , which he and his Family and Friends , travelling with him fought very bravely ,But as the Yazeed’s Army has Out Numbered his Companions , as it was 72 against an Army of 30,000 Men . So as a result almost all the Male Family Members and Friends were Martyred in this Unprovoked & Unbalanced War. While the Only Male left alive in the Imam Hussain’s Companions , was Imam’s Eldest Son Imam Zain ul Abideen a.s , Who could not take part in the War , as He was suffering from severe illness , and as a result , All the Left were taken as Prisoners , which included the Imam Zain ul Abideen , and the Women and Children , who were accompanying Imam Hussain , during his travel . While all their Belongings were taken away forcedly by the army of Yazeed’s , and the Brutal and the Army of Holigans didn’t spared tearing away the Ear Ring’s from the Young Lady Sakina , Due to which Her Ear’s started Bleeding and these Savage Beast , Not only stop their atrocities on this , but kept on Beating the Young Children and Women , which is a War Crime as the Prisoners of War , and specially the Ladies and the Children are always under Amnesty , and if not , then even they are Not liable to be punished or Beaten , but Yazeed was the Leader of the Savage Barbarians , and it was this due to which Imam Hussain a.s , have refused to accept the allegiance of Yazeed . As According to the Yazeed and his ancestors Plan they have accepted Islam , Not only to take the Benefits , but also to Malign Islam , Once they come to Power , But as Imam Hussain a.s , who refused to accept his allegiance , But also stood in their way , and clearly Showed the Difference Between the People who were trying to Malign and Defame Islam , by tormenting it , while On the Other Hand Imam Hussain in his Battle of Karbala , and after His Martyrdom His Son Imam Zain ul Abideen ,and his Sister the Great Lady Zainab by Openly Confronting Yazeed and his rule , in their speeches in his Court , full of his Friends and Ambassadors of Different Nations , who later even Endorsed and Distinguished Between the Mockery of Islam Created by Yazeed and his Predecessors , and the Genuine Islam in its Letter and Spirit Propogated by Imam Hussain and his Descendants and Predecessors. The Lady Sakeena Bint e Hussain who was the Favourite Child of the Great Imam embraced Martydom in the Dungeon , where she was Imprisoned and being tortured by Yazeed and His Companions . And these Takfiri / Wahabi are actually the Progeny of Yazeed , who have always lost their battles from the True Muslims and the Faithfuls and thus , who could not win Over the Living Legends , So now even try to attack the Graves of these Noble Personalities , as they are even afraid of these martyrs , as they even belief that the Blood of Martyr will Revolutionize this World and all the Crimes of these Apostates in the Cover of Islam will be Unearthed by the followers of the True and the Original Islam , which is a Religion of Peace and Harmony. Sayeda Sakinah bint al-Hussain (P) was the Youngest daughter of Hussain ibn Ali (P). The word Sakinah is a derivative of Sakoon meaning Peace. Sayeda Sakinah was the most pampered daughter of Imam Hussain ibn Ali (P) and He Pampers her so much that she used to sleep on his chest every night. But at the same time , as she belonged to the Most Noble family of all ages & time , Cast and Creeds, So even at this tender Age she was a reciter of Holy Quran and never missed Her Prayer , and her answers to any question was well supported by her Knowledge of Islam. This entry was posted in Jafria, Middle East and tagged Bibi Sakinah Bintul Hussain, holy shrine, Hussain ibn Ali, imam hussain, Lady Sakina Binte Hussain, Sakina Bintul Hussain, Shi’a Imam. Bookmark the permalink.